If you’re a freelance accountant or a member of a small team that has just purchased FreshBooks, you’re in the right place. The platform is known for its simple interface and outstanding navigation, but a guide through the invoicing process to make sure your extract the most from the software’s capabilities can still be useful. In this guide you can learn useful FreshBooks tips like how to send your invoices in just a few moments, and how to keep your payments timely. Before we delve deeper into the details of FreshBooks cloud accounting, we invite you to check our detailed FreshBooks review of the app to better understand why all the features included in this solution (there are a couple of hidden gems you may not notice at first glance). Among other things, you can read about FreshBooks cost, billing & invoicing features, integrations, and their great reporting capabilities. The first step is to explore the dashboard, which shouldn’t take much time considering its simplicity. Just open the Homepage, choose Invoices, and all relevant operations will reveal themselves in a dropdown menu. In case you’re still not a registered user, but one looking to explore the product you can learn a bit more about FreshBooks invoicing here or simply check a free trial of the app that will allow you to examine all key features with no risk involved. Anyway, the next thing to do is to examine the options on the popup Invoicing screen, including the ‘Creating an Invoice’ tab which will appear somewhere in the middle. Enter your business address so that it will automatically appear on all documents, and let customers know how and where to pay you in case they are allowed to choose. Adding your data is the initial phase. The next one which is even more important is to add the address and other relevant information related to your customer. Before you do done it, select how the customer ought to be billed, using filters such as Billing Items, Time, or both of them, and then go on with the process. Once are fields are filled, proceed by saving the client (there will be a special button for it at the bottom of the popup box). What you must remember here is that you only get to add the customer’s email address once, and that will be the address where the invoice is going to arrive. Once done, proceed by entering relevant invoice information, including its number, preferred payment method, issuing date, PO numbers, or discount values, if applicable. When adding a discount though, note that the system discounts the amount from the total invoice value (you can see the result at the bottom of the newly created document). Nevertheless, if the preferred coverage method is credit card payment, the additional fees that apply will be visible after the invoice is sent. If you’re charging per product, add your items the standard way. Service providers undergo a slightly different procedure – they need to choose the ‘Task’ option under the heading, and add issues as tasks, clicking on ‘New Task’ for each of them, and saving them separately. In case you’re charging for both products and services, the process will go as usual. Proceed by inputting titles and time entries for each task (product or service), and rate them within the form. Save the task by clicking on the save button. Some of you may think adding and saving each task is not relevant, but it is a very smart course of action for reusing tasks for upcoming invoices, as all of them will be saved in the task menu, and accessible with a single click. In order to avoid confusion, replace the default name ‘task’ with the name of the product/service to be paid, and add all relevant details in the entry note (descriptions, rates, cost unites, time estimations, etc.). The advanced time tracking system will use this data to count the time that has passed after sending the invoice – it will include this information in all messages exchanged with the client, and add it automatically to your monthly report. Nevertheless, don’t forget to insert the quantity of items you’ve sold, or the number of hours you’ve spent working to provide the service. The next part is the one no accountant likes, namely tax summarizing. Luckily, FreshBooks makes this simple too. All you need to do is to open the Tax column, pick the appropriate row from the items you’ve inserted, and choose Edit. The first thing to add is the name of the tax you need calculated (a universally-accepted abbreviation of it), and then also the rate that applies, and the ID number of the taxpayer. Save the information, click on the column again, and choose the tax from there. If you deem it necessary, delete rows or add such. Just as in Microsoft Excel, you can do this by placing the cursor on the row, except that this time it is even simpler. FreshBooks provides visual cues such as green plus signs for adding things, and red X signs for removing them. Right click and ‘Add line’ selection will lead you to the same results. Finally, input any additional note or payment term that applies and you wish to see in the invoice. You can save the draft to use it later, send it directly to the client’s address, or send it via snail mail. Snail Mail means you’re activating FreshBooks’ option for mailing physical copies to clients. Assume that the invoice is sent and received. You’ve emailed it, meaning that the client had no way not to receive it immediately. In case you’ve selected Snail Mail, the process shouldn’t take longer than 2-5 business days. The cool feature to benefit from in this case is tracking, because you are allowed to see whether the client has opened the invoice message or not. There are several ways for the client to cover the invoice, including PayPal, credit card payment (FreshBooks Payment Portal), Amex, and Google Checkouts. The simplest way is FreshBooks Payment Portal, because all the client has to do is to choose ‘Pay Now’ option on the invoice. In such a case, FreshBooks will charge 2.9% of the deal with an additional $0.30 transaction fee for all credit cards. The only exception to be aware of here is paying with American Express, in which case FreshBooks charges 3.5% of the amount. The good thing about using FreshBooks Payment Portal is being able to direct all paid invoices to a preferred bank account. In case you’re dealing with a client that makes regular purchases each month, you can tag him as a ‘recurring payer’ and rely on FreshBooks to send invoices to him automatically. 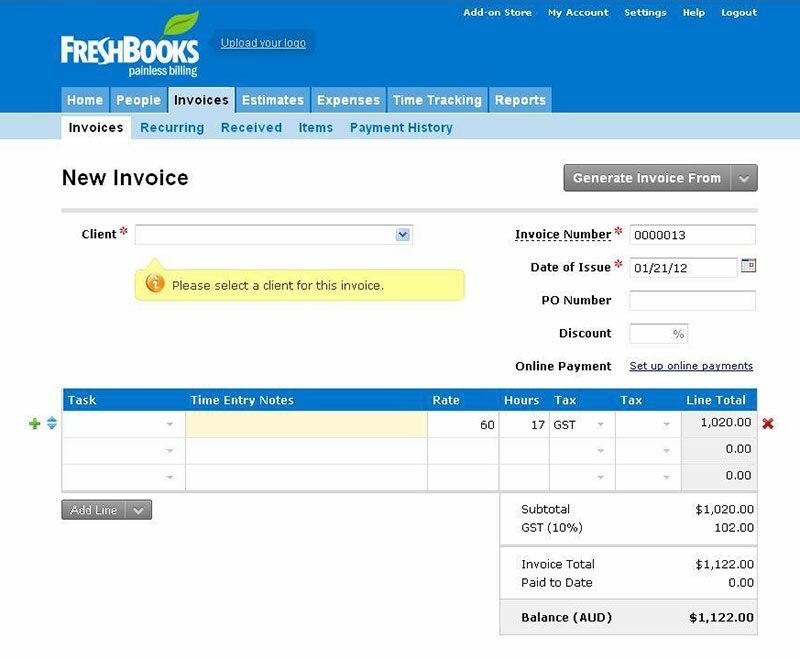 Why Choose FreshBooks For Your Invoicing? Indeed, the market is overwhelmed by small accounting systems and big promises, so why should you choose exactly this app to manage your invoices and finance? The answer can be found in the numerous benefits FreshBooks has to offer, and which we’ve summarized for you to consider if you’re not a FreshBooks user yet. We do recommend signing up for their free trial plan first though, or if you want to check some alternatives you can take a look at our Quickbooks vs. FreshBooks comparison. FreshBooks provides you relieble financial control. Needless to say, keeping invoicing within the appropriate timeframe doesn’t only eliminate the headache of running late, but it also makes you look more professional in the eyes of your customers. The time you get to save is time well-used, as you can invest it in other aspects of your business that probably deserve more attention. By streamlined invoicing, we actually refer to an automated process where you don’t send invoices month by month, but let the system remember recurring payments and remind customers of them. The plug-and-pay mechanism FreshBooks users like so much will allow customers to pay immediately upon receipt, and that’s probably the most important benefit to remember about this system. It doesn’t take more than common sense to arrive to this conclusion: if FreshBooks is covering all of your invoicing needs the entire accounting process will be facilitated as a result. Once an invoice has been paid directly on the platform, FreshBooks places it into your accounting reports, which eliminates all need to spend time on manual entries. The bonus in this case is that no harmful human errors can occur. It is completely understandable for experienced accounting teams to deny triggering software to send their invoices out, but then the question of why they do it remains unanswered. The reason is that automated accounting helps them push their future invoice factoring needs through, and ensures they will be approved.